Childwall Lingotot Centre | French and Spanish classes for kids. MFL PPA cover. 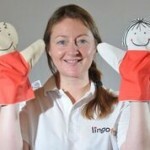 My name is Gill and I will be running Lingotot classes in Childwall and the South Liverpool area. I am a mum to two little girls of 9 and 1. Whilst on maternity leave I was looking for Spanish classes to attend with my young baby as I knew it was the perfect time to introduce a second language. Whilst searching I came across Lingotot and quickly realised that it ticked all the boxes and more; a fun and interactive way for my daughter to learn another language and the opportunity for me to continue teaching languages in schools as well as in nurseries and community classes using a wealth of fantastic resources. After studying Spanish at university and spending a year abroad in eastern Spain I trained as a secondary languages teacher. I was fortunate enough to teach across all Key Stages and absolutely loved the enthusiasm of the little ones and was amazed at how fast they picked up new words. Lingotot lessons are a wonderful mix of interactive games, songs, stories and crafts conducted almost entirely in another language; you get to learn alongside your child whilst having lots of fun together. Classes are suitable for babies, toddlers and young children and we offer plenty of support for parents/grandparents in order for you to continue your family's learning at home. We run sessions in primary schools, nurseries and in community venues across the area, please get in touch if you would like to see Lingotot in a venue near you or if you have any questions, you can reach me on the Lingotot Childwall Facebook page, or on my email address liverpool@lingotot.com. à bientôt / ¡hasta pronto!